VHF 1/4 wave Ground Plane antennas are available for VHF Business, MURS and Marine Radio bands plus the 2 Meter and 220 MHz Ham bands. 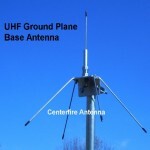 We can also furnish custom ground plane antennas for any frequency above 87 MHz. 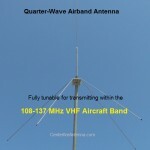 Available for 70cm Ham, GMRS, LMRS or Business bands. Our VHF Modular Dipole can be used as an omni-directional dipole or as a directional 2 element beam antenna that provides up to 3 dBd gain! 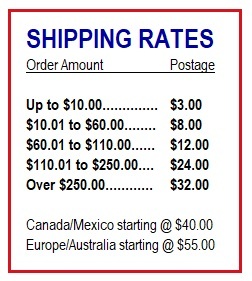 Available for 2 Meter Ham, MURS, Marine, Weather or Railroad. 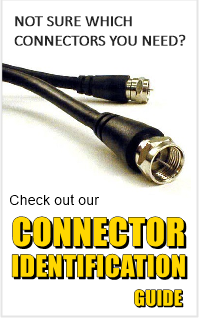 A great antenna for scanning or transmitting. Our 6 Meter Rigid Dipole is a very portable center-fed 1/2 wave antenna that can be used vertically or as a horizontal antenna. 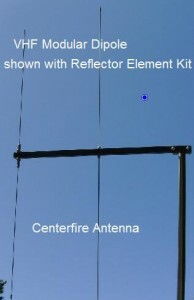 This antenna can be easily and quickly set up and disassembled in the field. Covers the entire 6 meter amateur band, 50-54 MHz. 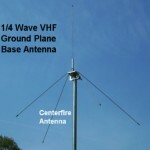 The FM Broadcast Band Ground Plane and VHF Airband Ground Plane base antennas have a 1/4 wave vertical element that can be tuned to any frequency within the 87-108 MHz FM or 108-136 MHz Airband ranges.